SAN MARCOS, Texas, June 19, 2014 Quantum Materials Corporation(OTCQB:QTMM) today announced the shipment of 20 grams of quantum dots to a major Asia-based global company. Quantum Materials accomplished the manufacture in a portion of the first week after installation and commissioning runs of the Company’s new automated production system. The precision afforded by automating production allows Quantum Materials to produce high performance tetrapod quantum dots and other materials with exacting quality control resulting in uniform structure, and tuned narrow emission FWHM. This custom delivery is the first of several that Quantum Materials has slated to be produced and shipped to potential partners and clients as requested for varied applications in the optoelectronic, photovoltaic and nanobiology fields. 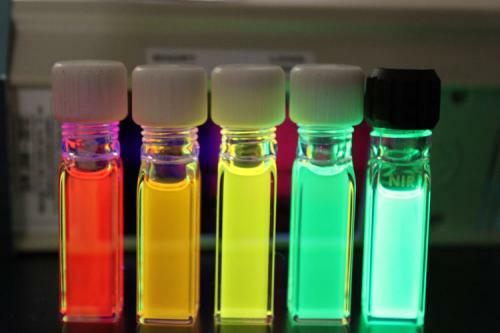 In optoelectronics, the uniformity of Quantum Materials quantum dots is intended to enhance color gamut and luminescence performance for targeted consumer electronics products. In photovoltaics, longer tetrapod arms exhibit higher conversion of photons for sensors and solar cells, and in nanobio, QMC quantum dots can be used for near-instantaneous, highly accurate results in diagnostic assays, medical imaging and as drug delivery platforms. This entry was posted in Energy Independence, Environment, Nanotechnology, Renewable Energy and tagged Cancer Treatment, Display Screens, Energy Independence, Environment, International & U.S. Business News Recon, Nano Batteries, Nano Drug Therapies, Nano Medicine, Nano-Bio and Bio-Medicine, Nano-Lighting, nano-security, Nanotechnology, Renewable Energy, Rice University, Science, Solar Cells, Solar Energy.